Participative development today is realized in the developing world as not only the ethically fairest, but also as the most competitive way of progression. This assumption is based on the conviction that the project development can only succeed if the to be developed embrace it as stakeholders. However, this posit implies an ‘ethics of understanding the foreign’, which entails an antithesis. On the one hand the aim of overcoming the foreignness of the foreigners in their role of the to be developed is formulated, since development is understood as an adaptation to the developer. On the other hand this posit of participation claims to use the foreignness via participation for the very development. The developmental collaboration with Islamic actors and organisations – as a topic of the present work – clearly shows the paradoxes of the participative approach and the ethics of intercultural foreignness understanding in general. The resulting dilemma-like act situations cannot be solved theoretically but have to be managed by practical compromises, which are described in this book from the point of view of developmental practices as well as scientists. This miscellany contains contributions dealing with the Islam as a religion, with development as a political and economical project and with the relationship which may hold between this religion and the challenges of modern life in a globalized world. Development cooperation with Islamic actors and organizations highlights particularly clearly the paradoxes inherent in the participative approach and the ethic of intercultural relations. Also a specific context must be taken into account here, i.e. the laic understanding of the state that is characteristic of most African countries and is not basically challenged by Islamic groups. Islam und Gute Regierungsführung – wie wirksam sind die Ansätze der Entwicklungszusammenarbeit? Islam und Mädchenbildung in Guinea – oder Wer hat Angst vor Madame Bovary? 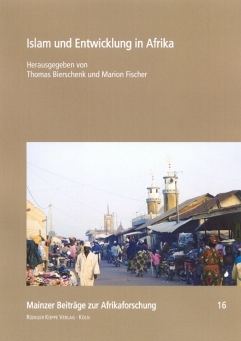 Thomas Bierschenk is Professor at the Department of Anthropology and African Studies at the Johannes Gutenberg University of Mainz where he is responsible for the focus area Cultures and Societies in Africa. His publications deal with a wide thematic spectrum containing state, politics, and development in Francophone countries in West and Central Africa. Marion Fischer has been scientific officer at the University of Marburg. Since 1984 she has been working for the GTZ Gesellschaft für technische Zusammenarbeit. She has been director of the counselling centre for Islam and development cooperation in the GTZ centre from 2000 to 2006. Today she runs a program for participation oriented urban development in Cairo. In our programme further monographs and collected papers on the topic Islam in Africa have been published, see the links below. Es gibt einen „afrikanischen Islam“, der stets wandlungsfähig war. Den Stolz darauf dürfte man Afrikas Muslimen vermitteln, um ihnen damit Mut und Selbstsicherheit gegenüber dem „arabischen Islam“ und zur Anpassung an sich verändernde soziokulturelle Rahmenbedingungen zu geben – dann wird auch Entwicklung leichter. In diesem Sammelband sind acht Vorträge aus einer Ringvorlesung zum Thema „Islam und Entwicklung aufbereitet“, die im Wintersemester 2004/2005 an der Universität Mainz durchgeführt wurde. Auffallend ist der hohe Anteil an Beiträgen, in denen – zumindest teilweise – verschiedene Entwicklungsprojekte der Gesellschaft für Technische Zusammenarbeit (GTZ) vorgestellt werden, so z. B. die GTZ-interne Beratungsstelle „Islam und Entwicklungszusammenarbeit in Afrika“, ein Projekt der Mädchenbildung in Guinea oder Landentwicklung im nördlichen Kamerun. Insofern verwundert es nicht, dass die Publikation seitens der GTZ finanziell gefördert wurde. Neben diesen eher praxisorientierten Beiträgen sind aber auch akademisch ausgerichtete Abhandlungen zu finden, etwa über Entwicklung und Eigenarten des Islams in Afrika oder Tribalismus in Mauretanien. Insgesamt gefällt der Band aufgrund seines breiten Themenspektrums; das Spannungsverhältnis „Islam und Entwicklung“ wird aus vielen Perspektiven beleuchtet, und die Schwierigkeiten, die aus der Zusammenarbeit mit muslimischen Entwicklungsträgern resultieren können, werden sachlich sowie überzeugend erläutert.